Store fresh-picked tomatoes on the countertop or windowsill. Do NOT store tomatoes in the refrigerator, as the cold damages the cell membranes, resulting in a mealy texture and loss of flavor. Store them stem side down. The theory is that the scar left from the stem on the tomato allows moisture to seep out as well as letting bacteria and mold get in. Keeping that side protected by storing them stem side down will keep them fresher longer. To ripen tomatoes, place them in a paper bag with a ripe apple or banana. 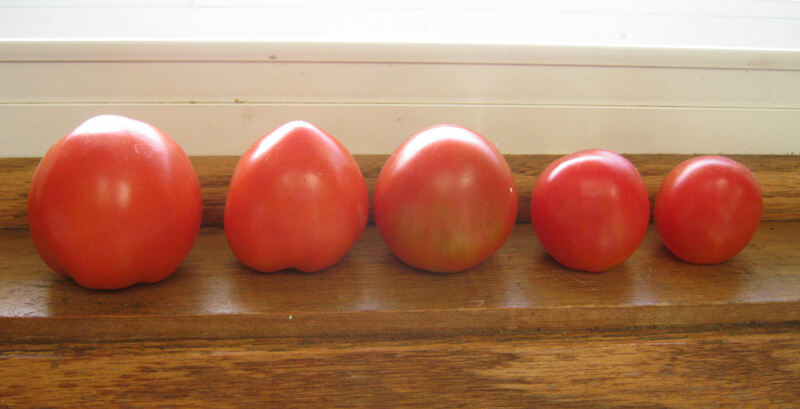 Ripened fruit emits ethylene gas, which will hasten the ripening process of tomatoes. For the best flavor, I like to leave my tomatoes on the vine until thoroughly ripened. 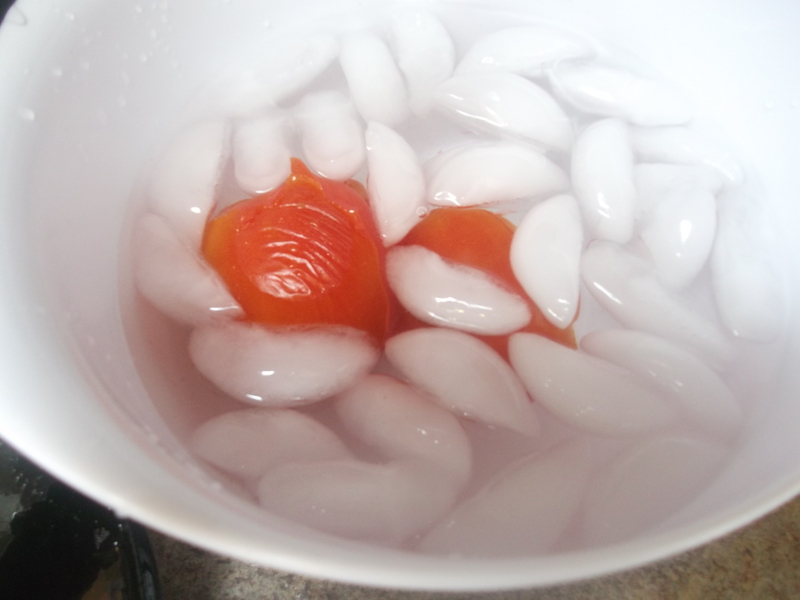 Peel tomatoes easily by blanching them in hot water. 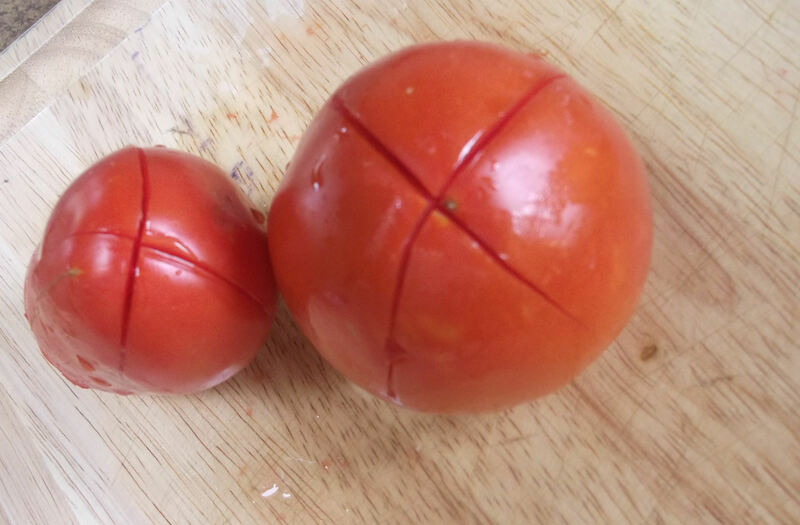 To begin, cut an X into the skin on the bottom of each tomato. Either a sharp paring knife or any serrated knife works well for this. 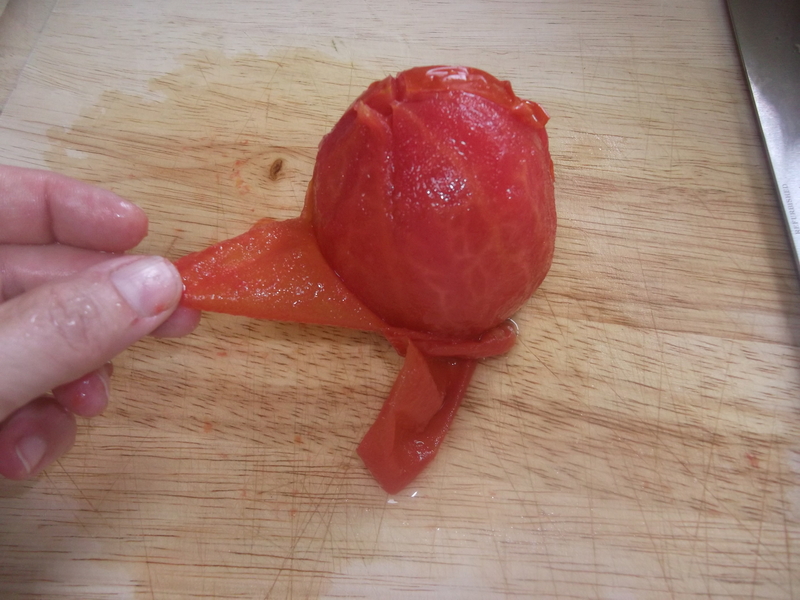 Just score the skin: do not cut too much of the actual tomato or it will fall apart. 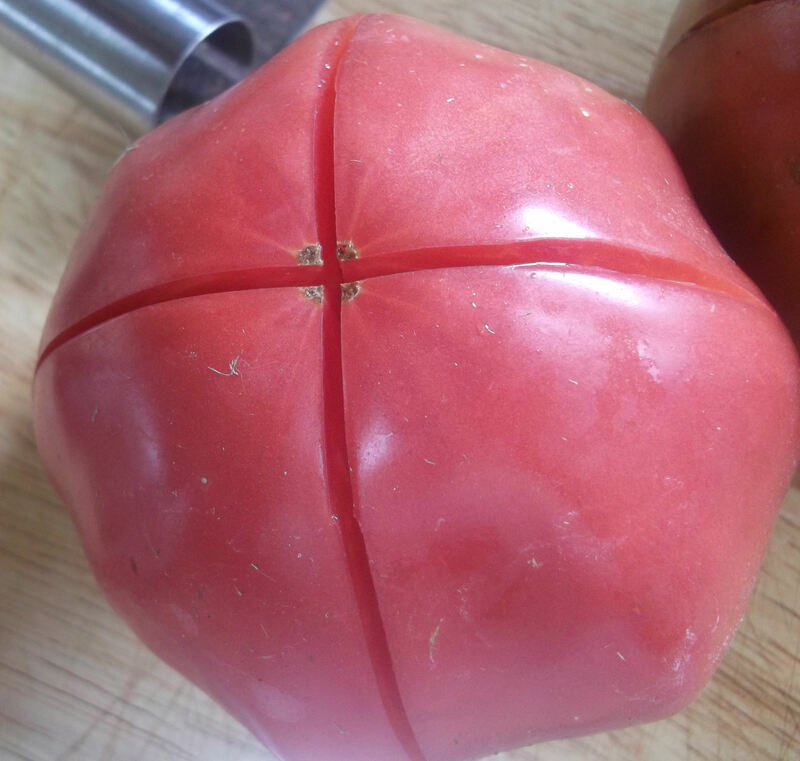 If the tomato has a scar on the bottom, either slice it off or cut the X right through it: this just makes it easier to peel later. 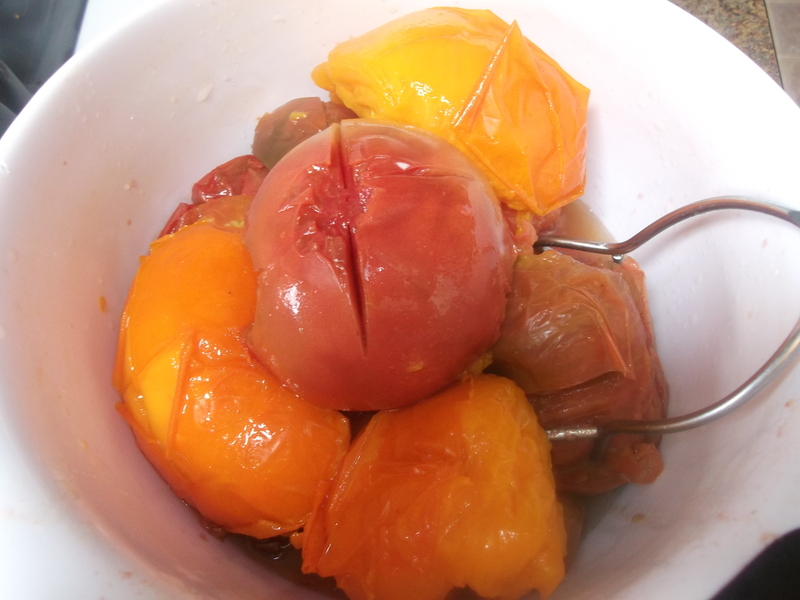 Plunge the scored tomatoes into boiling water until the peels start to pull back, usually about 30 to 60 seconds. 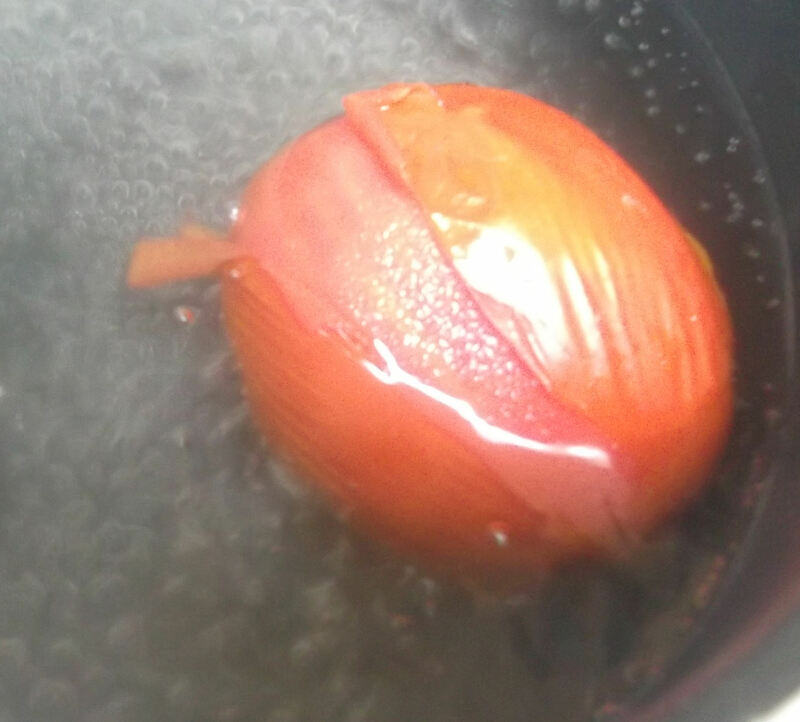 Using tongs, gently remove the tomatoes from the boiling water and, if peeling right away, place in a bowl of cold water and ice to cool. If peeling later, just pile them up in a bowl and let them cool. When the tomatoes are cool enough to handle, the skins will peel off easily.